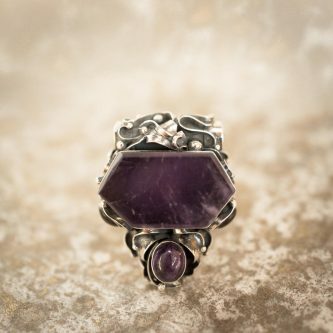 Amethyst awakens inner wisdom and grants an understanding of hidden knowledge. It is able to transmute energy and open portals to the non-physical worlds, which is why the ancient Magi believed it to protect against black magic. Amethyst helps its wearer to gain awareness and break old destructive patterns by bringing in high vibrations and facilitating conceptual change, while simultaneously changing toxic emotional reactions. It helps one to release negative attachments and habits, and supports development of energetic channeling, interaction with one’s energy guides, psychic abilities, and inner wisdom. It also promotes fearless speaking and helps you stand in your truth no matter what. Physically, Amethyst helps heal the nervous system, migraines and headaches, as well as mental issues such as anxiety attacks, epilepsy, and schizophrenia. It also enhances the immune system, cures allergies, and supports vitality in the blood.